This is a great photo with one of our girls, Daniella, taken on the airplane on our way home to Sweden from Family Fest in Gatlinburg in May. 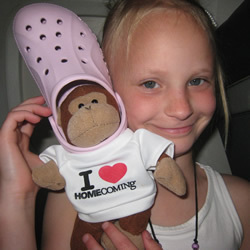 It pictures Daniella with one of the Homecoming monkeys you gave them. Felicia, her sister, also got one and they named their monkeys Bill and Gloria. They are so happy about them, since they are two dedicated “Homecoming kids.” They enjoy watching and listening to all of the Homecoming Kids projects. The GVB album, I Am a Promise, is a constant play and their new favorite (when they are not listening to Charlotte Ritchie´s new CD, another favorite). We keep calling our girls “the Swedish Homecoming kids.” I think the photo is rather cute, and they are a great story of how the Homecoming music has landed in children’s hearts and minds … all the way to our kids in Sweden.